These days, sending guests directions and hotel information is simply not enough. Brides and grooms are making a real effort to take care of their guests, which, in turn, makes guests feel appreciated and tended to. Here are a few touches that will make your guests swoon over your thoughtfulness. 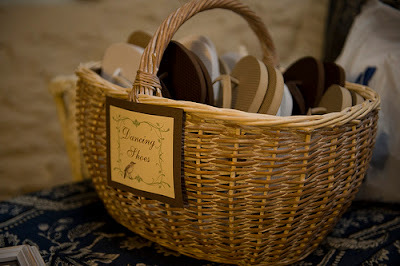 * flip-flop basket: even the most comfortable heels can start to pinch after a night of dancing. Why not offer a basket of flip-flops (bought on the cheap at Old Navy or Target) to your guests, so they do not have to make the choice between dancing in heels or (no no no) dancing with bare feet. * hotel bags: these are pretty standard these days, but guests feel so pampered when they check into their hotel and get a goodie bag. It's nice to include directions and an itinerary of the wedding events, as well as some snacks and drinks and definitely a personal note from the bride and groom. 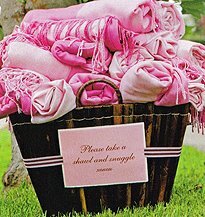 * wrap basket: if your wedding is outdoors, it may be nice to offer wraps to your guests. Even summer evenings can get a bit cool. You can purchase inexpensive pashminas these days online or in cities. What a sweet way to keep your guests nice and cozy. * transportation: Guests love weddings where the bride and groom provide some sort of transportation between the hotel and reception venue. Knowing they do not have to worry about directions and can relax and kick off their heels at the reception is priceless. Your transportation does not have to be fancy: a school bus or van will do the trick. * drinks: offering your guests a drink to comfort them at the beginning or end of the ceremony is also a nice touch. 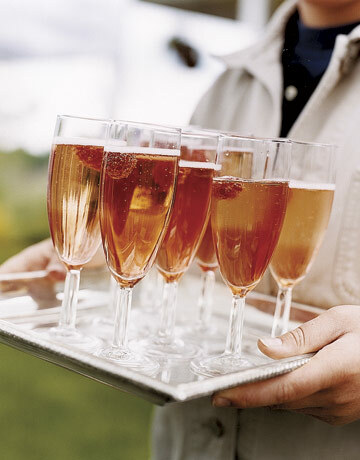 Think ice-water with mint or lemon as they arrive at your outdoor summer wedding; or a cup of hot mulled cider as they depart from your fall wedding reception; or even a glass of champagne as soon as they enter the cocktail portion of your reception. Along this line: make a point to have butlered drinks during the first 15 minutes of your cocktails - it will cut down, if not eliminate, the all-too-common bottleneck at the bar as people make a bee-line for a cocktail. * morning after brunch: Jamie blogged about this recently, and I think it is a fabulous idea. If it is in the budget, it's so nice to host a morning-after brunch for your guests. And even if you cannot swing it financially, perhaps make reservations and invite your guests to join you the morning after the wedding. Just be sure to make it clear to them that they are on their own for the bill. Hopefully this will give you some ideas for ways to make your guests feel special at your wedding. What do you think -- do you have any other suggestions? Please do share. To give a gift or not? 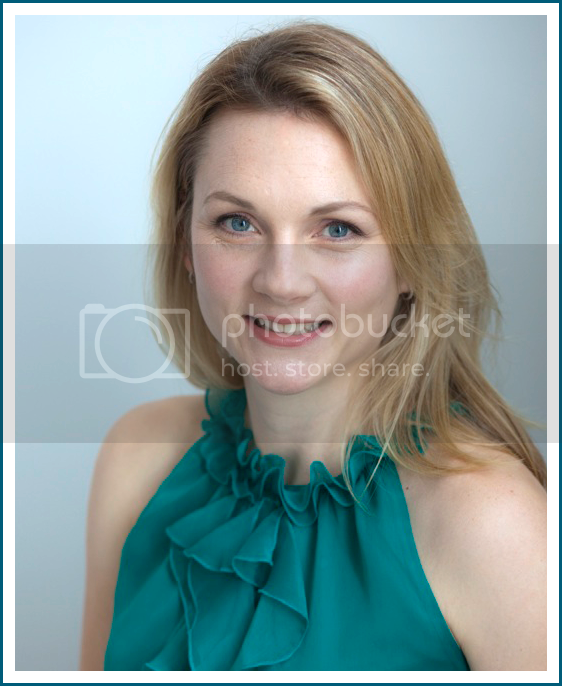 Yay or Nay: Pictures before the wedding ceremony? Morning After Brunch - yay or nay?